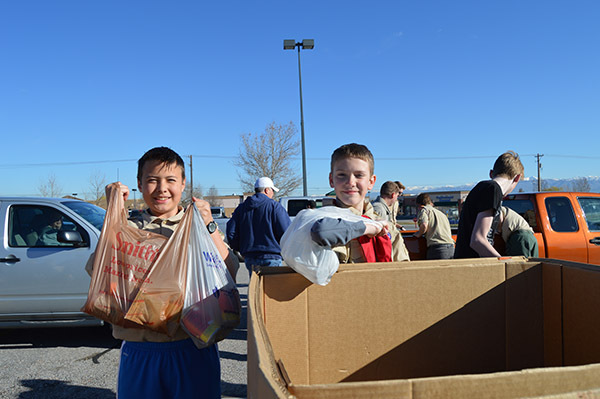 Utah Food Bank and its partner agencies across the state are working with the Boy Scouts of America to help Fight Hunger Statewide during the 33rd annual Scouting For Food, scheduled for Saturday, March 16. This food drive comes at a critical time when supplies at Utah Food Bank and emergency food pantries are beginning to thin following the holiday season. This effort has provided the equivalent of over 19 million meals since the effort began, and scouts hope to hit the 21 million meal mark with this year’s efforts. To put that in perspective, if each household in Utah donated two cans of food, they would reach their goal! Scouts will be going door-to-door across the state to distribute reminders to Utah residents during the week of March 11th. Utah residents are encouraged to fill any bag or box with non-perishable food items to leave on their doorstep by 9:00 a.m. on Saturday, March 16th, when Scouts will return to pick up the food donations. All donations will be delivered to Utah Food Bank, regional food banks, and emergency food pantries statewide. Alternatively, donations can be dropped off at your local food pantry or regional food bank, or at Utah Food Bank’s Salt Lake warehouse (3150 South 900 West). Once again, the Utah National Guard will come out in full force with logistics support on the day of the food drive as well! Residents who receive door hangers as reminders may also support the Scout’s efforts financially by taking their door hanger to any Smith’s Food & Drug Store between March 15 and March 18, where they can donate at check stands. Donated food should be commercially packaged (non-glass), non-perishable and nutritious items (ideally low-sodium and low-sugar items). Most-needed food items include beef stew, chili, peanut butter, boxed meals, canned meats and canned fruits and vegetables. For more information about Scouting for Food or to find a local food pantry, visit www.utahfoodbank.org/scouting.